It’s time for a discussion of Russell Stevenson’s For the Cause of Righteousness: A Global History of Blacks and Mormonism: 1830-2013 (Greg Kofford Books, 2014; publisher’s page). I bought my copy at a book signing at Benchmark Books in Salt Lake. Deseret Book is carrying the book, but if you live in Utah County go pick up a copy at Writ & Vision, Brad’s new operation (on West Center in Provo, used to be Zion’s Books). We are fortunate to have Russell presently doing a guest blogger stint here at T&S, so I look forward to his responses to my review and to your observations or questions in the comments. 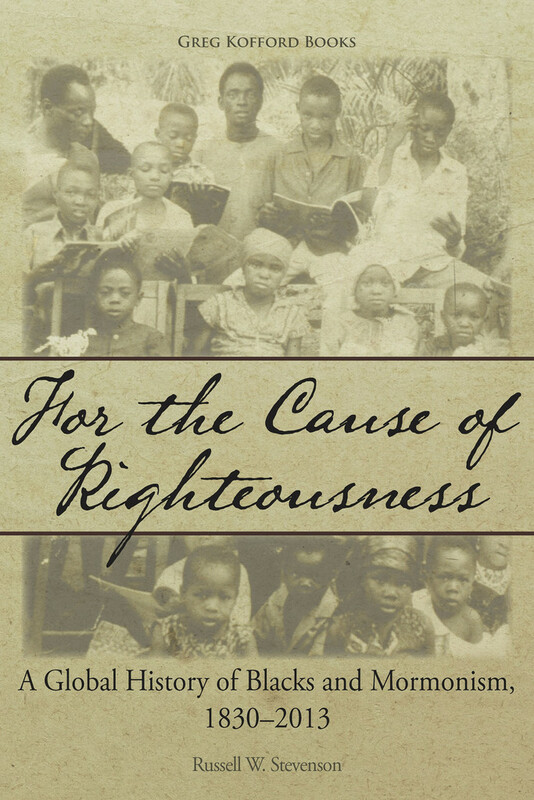 For the Cause of Righteousness is both comprehensive, as it takes a global view of the topic for the entire history of the LDS Church, and timely, coming just after the Church’s publication of the definitive Race and the Priesthood essay. And the issue of race and the priesthood is not just an isolated topic or chapter in our history; it is a central theme that runs right through the middle of LDS history, from the first decade right up to today. It’s not a pretty story, but it is one that you, as a Mormon, simply need to know. The book is comprised of two distinct sections. The first section is a narrative treatment covering the LDS history of the topic in about two hundred pages. The second section is another hundred pages reviewing and presenting selected documents covering the same period, from Elijah Ables’ 1836 priesthood ordination certificate (p. 211-12) and 19th-century explanations of the priesthood ban by Brigham Young (p. 252-55) and B. H. Roberts (p. 290-92), to 20th-century arguments for and against the ban that finally get us to Official Declaration 2 in 1978 reversing the ban (p. 343-44), the 2012 press release at the Mormon Newsroom following the Bott Affair (p. 352-54), and ultimately the Race and the Priesthood essay published in December 2013 (p. 355-57). The documentary section is important. Anyone can write a narrative of past events with commentary and explanation; documents are fixed points that nail down an accurate, credible historical account to the real world of actual historical events and distinguish a credible narrative from speculative or even invented accounts. The meat of the book is the seven-chapter narrative account in the first two hundred pages. Chapter 1 covers 1830-47, describing Mormonism’s encounter with both abolitionism and slavery, which was particularly difficult in Missouri. Chapter 2, “Cursed, 1845-90,” chronicles the rather puzzling shift, following the murder of Joseph Smith, away from ordaining African American converts. It happened quickly: “By spring 1849, [Brigham] Young began drawing a firm line, making his first comments explicitly denying priesthood ordination and temple blessings to those he considered to be tainted with the blood of Cain. These comments formed the theological foundations for the LDS Church’s race-based restriction ban for nearly 130 years” (p. 17). Chapter 3, “The Long Night, 1890-1960,” tells how the Church in various countries dealt with the priesthood ban in practice, as well as how faithful black LDS Saints persevered in the faith despite the doctrinal and personal prejudice they faced. Russell did a T&S post on one such Saint, William P. Daniels, who directed an LDS branch in South Africa in the early part of the 20th century. I think this is now the primary scholarly treatment of the LDS race and priesthood history. There have been previous books by LDS authors looking at the LDS priesthood ban as policy and as doctrine. This book is straight history, in particular the 100-page documentary section. But even the 200-page narrative section plays it straight: it’s all history, with almost no commentary or criticism from the author. Reading the book, you may find yourself at various times feeling shame or pride or even anger at the statements or actions of various historical actors, but the author refrains from voicing any of those responses in the text. I think the book would have benefited from an additional Chapter 8 reflecting on the events recounted in the first seven chapters. After all, we want to learn from our history, so it is okay to offer a few apparent lessons. The closest the author comes is this statement on page 121: “Perhaps the most remarkable aspect of the ban’s intellectual history is the reliably inconsistent nature of its rationales.” On the other hand, we’re living in LDS Retrenchment 2.0; maybe stating the facts and letting readers draw their own conclusions is a wiser course for young LDS scholars. That, in fact, may be one of the lessons to be drawn from those who publicly criticized the LDS priesthood ban during the 20th century (see Chapter 5). Those who were scapegoats may one day be heroes. why do we insist on talking about “blacks and the priesthood?” it wasnt just black men that were banned from ordinances. it’s not like black women were allowed to get married in the temple. PW, you are right that the temple exclusion part of the policy is often glossed over, but I think Russell was quite cognizant of this in the book. In particular, there is a detailed discussion, supported by several letters, of Jane Manning James’s persistent attempts to be admitted to an LDS temple to receive her endowment in the last part of the 19th century (p. 283-86). Dave: can a book that has “almost no commentary or criticism from the author” really be “the primary scholarly treatment of the LDS race and priesthood history”? Isn’t scholarship making commentary and an argument? Jack P — there was commentary/criticism in the narrower sense introducing and evaluating documents (in the second section). But in the broader sense, I would say the book *reports* the history of the doctrine and practice rather than *critiquing* that history. Certainly a different author could take some of the material in the book to construct a critique. But the stronger the position one takes vis-a-vis the material, the greater the chance that agenda biases the author. So it’s the author’s choice how to approach the material. I suppose each reader gets to make their own determination whether the strictly neutral approach works in this particular case. For my part, it’s more representative of my personal writing DNA. I deploy the kind of approach that I do in the spirit of one who is seeking to understand causation, the changing relationship of peoples of African-descent and Mormons over the time, the forces that made the global black Mormon experience. My work should provide the foundation for those seeking to have a well-rounded and thoughtful conversation about the origins, course, and outcomes of the restriction. Moreover, my introduction does speak to my views on how the relationship came into being, that it was a product of a peculiar kind of power relationship that has not been entirely explored in the Mormon historiography. Can anyone comment on how this book covers territory similar to or different from Paul Reeve’s recent book, “Religion of a Different Color”? JMS: Yes. This book is not nearly as good as Reeve’s. Thanks for the review, Dave. I will order my copy today. I do, however, have one quibble and one request. My request: I share your view that we living through LDS Retrenchment 2.0, and I’d love to see you expound on this subject in a separate post. Farside, I was referring to the statement disavowing prior theories about the priesthood ban as definitive, not to the essay as a whole in relation to the topic as a whole. Plainly, both Russell’s book and the recent book by W. Paul Reeve show we still have a lot to learn. I think part of the reason why it’s often referred to as “the priesthood ban” is that temple worship is understood to be a priesthood function for all involved. This could be seen as dignifying and empowering of women rather than ignoring or dismissing them. Does the book look at the relationship between the Church and its doctrine to other racial minorities? In contrast to the limitations on full participation in priesthood and temple ordinances for people of African descent, the Church from its beginning sought to recruit, baptize, ordain and endow members of other minority “races” who tended to be lumped with blacks by the kind of classic Southern racist, as well as by more enlightened Northerners. Being American Indian, Hispanic, Polynesian or Asian meant second class citizenship in America through the 19th Century and the first half of the 20th, but the Mormons were actively recruiting from those populations during that entire period. RTS, the book is focused, as its title says, on the history of blacks and Mormonism. With that comprehensive a topic the author already had to skim over great amounts of history, just touching lightly on fascinating topics like the Church in South Africa, so your point, interesting as it would be to read a book on the topic, is outside the scope of Stevenson’s book. Those are interesting questions, and I know more than a few scholars (e.g. Ignacio Garcia) who have legitimate criticisms that Mormonism’s racial history has focused disproportionately on its relationship with peoples of African descent. I would advise against conflating active proselytizing efforts with a theology of racial equality. The Saints deployed “cursed” language in regards to Mexicans and Native Americans, seeing themselves as a kind of benevolent patriarch meant to “lift up” the native peoples of the Americas. Giving them priesthood office and administering saving ordinances does not mean, in these cases, that the Saints saw indigenous peoples as being like unto themselves. I had recently completed reading Stevenson’s book, and found it to be a challenge to an African-American in the Church. My eyes kept me on the new stuff that I didn’t know about, especially that of Africa per se. The church’s missionnary efforts were interesting, as well as informative. It took me two months to read the book thoroughly, and especially the documentation portion. I have learned a great deal by studying the end notes, because I am presently compiling a massive comprehensive bibliography on “Latter-day Saints and Black Americans, 1830-2015.” Have been working on this project since having retired fromm the United States Senate Library in 2009. Enjoying it very much, learning more each day while compiling this bibliography. Again, let me say that I enjoyed reading Stevenson’s book immencely (sp). Now, I am reading Reeve’s, and I am on Chapter. Thanks for the review, and have a great evening.